Psychologist Michael Graziano proposes that our consciousness is more mechanical and less mysterious than we think. But he argues as well that this theory does not diminish the validity of our spiritual experiences. Graziano, in Consciousness and the Social Brain, fully appreciates what our consciousness, our awareness, means to us. It is “the spark that make us us. Something lovely apparently buried inside us is aware of ourselves and of our world” (Kindle location 66). And many of us believe this lovely spark to be our spirit, even our soul. But how does it work? Despite all that neuroscientists know about the brain, what remains elusive is how it goes about giving us the experience of being aware, awake, taking it all in. Theories suggest that the brain’s signals are “boosted, improved, maintained, or integrated” in some way that creates the sensation of awareness. But they don’t say how. Graziano’s explanation is not really complicated, but it is so different from our everyday experience that it helps to understand first the main concept that it is built on, one that is well-established in neuroscience. This concept is that the brain recognizes things because it makes simplified models of them, shorthand versions that are similar to codes or diagrams. Examples of these schema include the formula a child’s brain will store away for identifying a dog (four legs, fur, friendly) and the sequence that adults know for entering a restaurant and ordering food. The brain stores such schemas and uses them to identify and even to imagine. 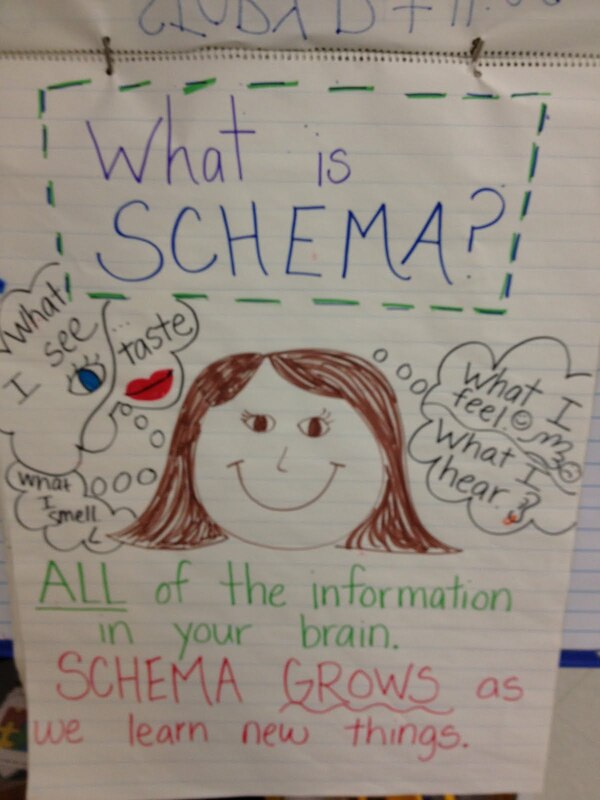 Schema theory applied in early education. The twist that Graziano adds to the schema idea is that our consciousness itself is a schema, the brain’s shorthand version of the act of paying attention. “In the present theory, awareness is an attention schema. It is not attention but rather a simplified, useful description of attention” (377). As for attention itself, it is an actual, physical activity; it “lights up” sections of the brain in ways we can take pictures of. The attention schema, on the other hand, is a simplified model of that activity as it is stored by the brain. Here is Graziano’s proposal in a nutshell. Take the example of a moment when we look at the bright green of spring and think, perhaps wordlessly, wow, what a bright, lovely green. Once that description is in place, other parts of our brain can verbalize it. We can say, “The green on this leaf is beautiful.” We are not experiencing green directly; a “color” is physically only electric and magnetic waves. We are experiencing the brain’s combination of two of its descriptions, the schema of greenness and of conscious attention. Such a view has prompted me to experience my own conscious awareness a little differently. I think it is like a camera that clicks twice every time it takes a picture. One click is the picture of the object in front of it, the second click is the camera recording that it took a picture. When I think to myself, like the man in the cartoon above, “I’m standing here” or some other self-aware thought, there is a click of noticing what’s around me and a click of noticing my noticing. But often it locates awareness inside someone else’s head, when we are imaging what other people might be thinking, saying, planning. Or it might locate awareness in our dog, in thunderstorms, in luck, or in a god. Or floating above our body when our brain is compromised during surgery and we have a near-death experience. And Graziano, a “passable” ventriloquist, notes how readily an audience will locate awareness and attention in a wooden dummy. Finally, one might expect a prominent psychologist such as Graziano to take a dim view of religious and superstitious beliefs. But in fact he eloquently embraces spirituality in particular. 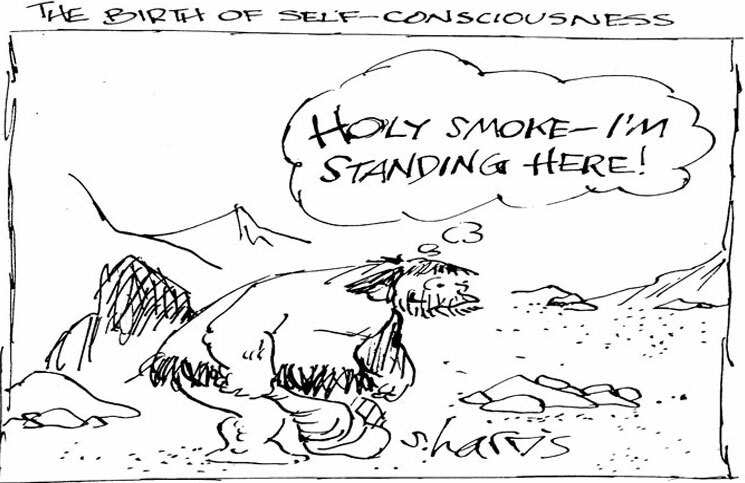 It is, after all, a matter of consciousness. For me, Graziano’s work affirms the spiritual value I find in the presence and the history of living things. This is not only because of his acceptance, just described, of people’s spiritual awareness. It is also because his analysis of consciousness helps me to see it as the work of natural selection. 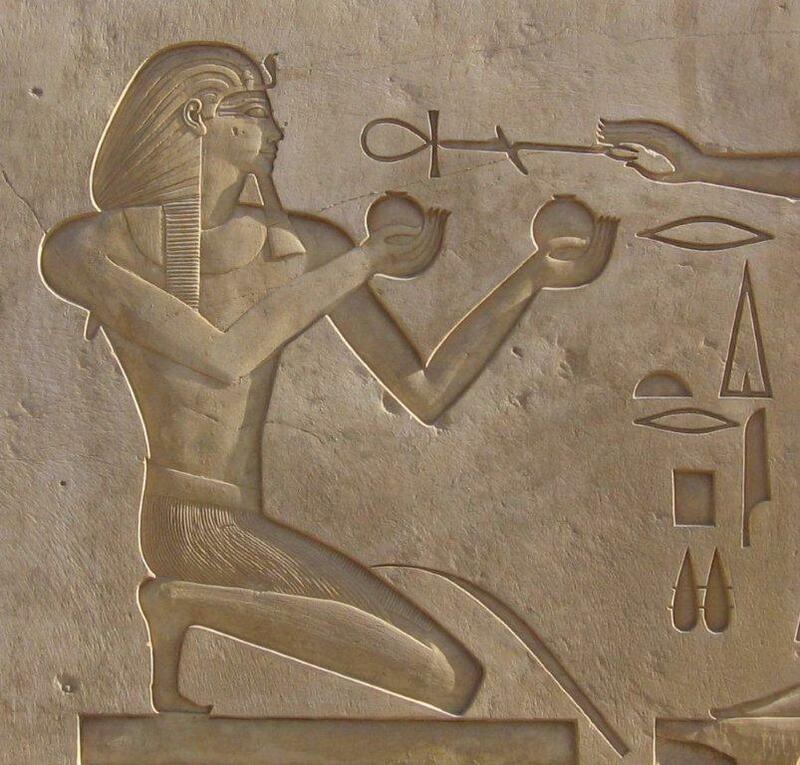 I see human consciousness as a unique elaboration of the capacities for perception and memory that are found in simpler forms in the brains of other and earlier animals. This entry was posted in Non-Theists, Religion and tagged brain, consciousness, schema, spirituality. Bookmark the permalink.